What styles of bi-folding doors are available? This type of door is made up of two panels. They open in a sliding direction of your choice. 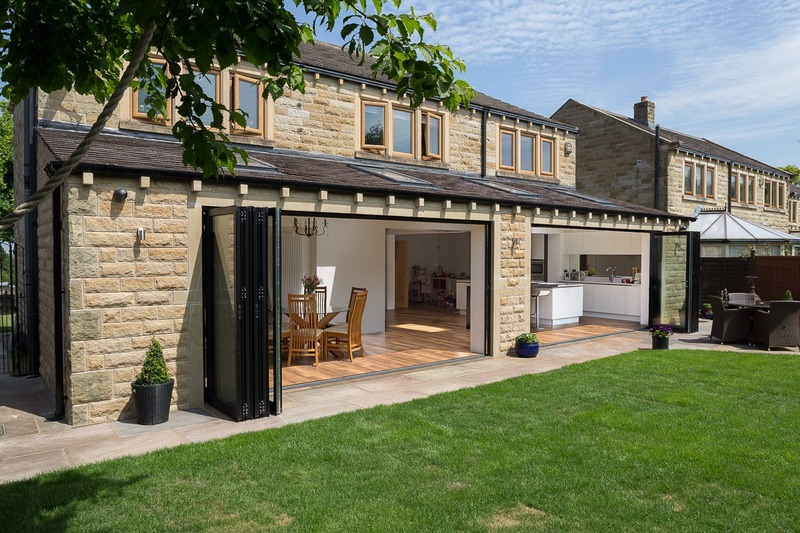 A two panel bi-folding door is often chosen as an alternative to more traditional patio doors. As the name suggests, this style consists of three panes of glass. Here, two configurations are possible – the first is where all panels open in the same direction. The second is that two panels open one way, with the third being a separate, hinged door. This is what is known as an access leaf and is useful as a regular access door (for example for accessing an external area from inside). This kind of door allows for more potential configurations. As with all other bi-folding doors, it is possible to open it by sliding all panels in one direction. Three sliding in one direction and the fourth acting as an access leaf is also an option. In addition, a hinged configuration can be set whereby two doors open one way and two the other – similar to the way French windows open, but with hinges. Bi-folding doors can also be tailor made with five, six or even seven panels. Our technicians are able to discuss possible configurations with you upon request. Clear View have been designing, manufacturing and installing aluminium bi-folding doors and windows since 2010. We work with both commercial and domestic clients to help them transform their work and living space. For more information or to get a free, no obligation quote please get in touch today on 0800 1357167.